“In all my prayers for all of you, I always pray with joy because of your partnership in the gospel from the first day until now, being confident of this, that he who began a good work in you will carry it on to completion until the day of Christ Jesus” (Philippians 1:4-6 NIV). An hour later, a nice man showed up to change my tire. Two hours later I left the Chick-fil-A parking lot and headed home. Now, this still might not sound like a very exciting story to you, but for me, it was a small victory. Here’s what I didn’t do. I didn’t cry, fuss at God, or fall apart because the air in my schedule leaked out with the air in my tire. And that, my friend, was reason to celebrate! My default mode would have been to do all three: cry, fuss at God, and fall apart. Then I’d go home in a bad mood for my husband to endure. But not today. So I celebrated that one good moment of a bad day when I responded well. Driving back home, and thinking about this one small attitudinal victory, I thought about a passage in the Bible. In 1 Samuel 14, King Saul and his men were battling the Philistines. His son, Jonathan, and his armor bearer left 600 soldiers relaxing under a pomegranate tree and went up to face their enemies alone. The duo killed about 20 men in an area of about half an acre. Then God threw the Philistines into confusion, and they started killing each other. It was a small victory, but a victory nonetheless. But rather than celebrate the win, Saul made a decree that the men couldn’t eat until they achieved total victory. Total. All the enemies destroyed. Jonathan didn’t get the memo about the moratorium on food. And as the army walked through the woods, he dipped his staff in a honeycomb and had a sweet treat. His eyes brightened, and he was refreshed. The other men were weak from hunger, and in no condition to fight. Jonathan’s dad was furious. Almost killed the boy. Almost lost the war. He was not a good king. Oh, friend, too many of us are waiting until we have total victory in our lives before we celebrate. We wait for perfection, which will never come. We beat up on ourselves for our missteps and mishaps. All the while we miss dipping into the honeycomb of celebration God provides. You’ll never have total victory this side of heaven, but you will have some. Don’t miss them! See them! Seize them! Celebrate them! Celebrate the times when you don’t yell at the kids. Hurray! Celebrate the times when you don’t respond to the sarcastic cashier with a sarcastic word right back. Praise God! Celebrate the times when you don’t fall apart because your schedule does. Do the happy dance! Celebrate the times when you didn’t eat that extra bowl of ice cream. You go, girl! Celebrate the times when you stubbed your toe and didn’t say a curse word. Well, praise God for that! God is changing you, transforming you, and re-making you every day. Paul wrote to the Philippians, “being confident of this, that he who began a good work in you will carry it on to completion until the day of Christ Jesus” (Philippians 1:6). Even though you may not respond to all of life’s foibles and fallouts in a God-honoring way, take a moment to celebrate the times you do. Lord, I’m so glad You’re still working on me—that You don’t give up on me even when I want to give up on myself. Help me see the progress I’m making, and not just the times I still fall short. Do you tend to focus on your failures or your victories? What do you think the devil wants you to focus on? What do you think God wants you to focus on? What did Jesus focus on when he met with Peter in John 21:15-17? His failure or his future? Leave a comment and share one recent victory, no matter how small. Let’s celebrate. Do you ever feel like you’re not good enough, smart enough, pretty enough, or just not enough, period? If so, it’s time to stop listening to the lies that sabotage your confidence and start embracing the truth of your true identity in Christ. In Sharon’s book Enough: Silencing the Lies that Steal Your Confidence, you’ll learn how to silence the voice inside that whispers you’re not good enough, accept God’s grace and no longer allow past failures to define you or confine you and be preloaded with the truth to fight insecurities. 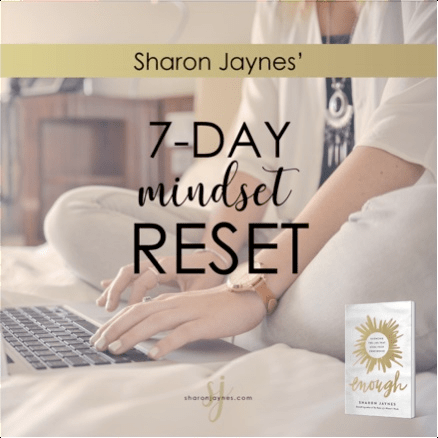 Also, be sure to sign up for the FREE Mindset-Reset to replace those lies with truth.